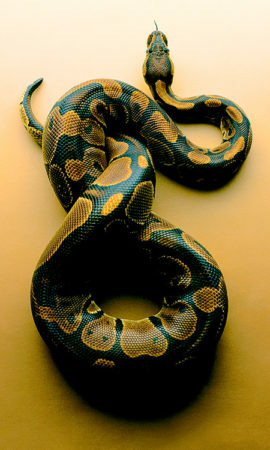 With a deep breath to suspend my anxiety & excitement, I bow my head and receive the full weight of the royal python. The serpent’s body uncoils around my shoulders and grips tightly, exploring the landscape I provide, and starting to wrap her tail around my neck. Slowly but with muscled intensity. My breath catches in my throat–this was the moment I had been fearing the most– I feel the snake start to tighten her grip. For a moment, panic. Heart thudding in my ears, mind racing, intent on my desire to face the fear of the unknown and determined to have a new experience. I had been thrown straight into the heart of my discomfort. With this breath, I relax my shoulders and the snake loosens her coil around my throat. A portal has just been passed through. I wished to dance with snakes. The most primal part of my soul told me I had done this before. It was completely unexplainable. There were fragments of visions of past lives that came through; in temples, during ritual, with gatherings of people. Remembering lucid, oracular states of being while communing with serpents during movement meditations. Creating magick through the dance. These visions lit me up, inviting an ancient aspect of my soul to come forward. I didn’t yet know how I would access the wisdom or resources to manifest this dream, only that it would come into being. Of the many learnings Serpent has brought to me, the one which speaks loudest is the key of embodied presence. When we fully occupy this moment, this body, this planet, right now, only then are we in union with our Godself, channeling divine power in a loving and conscious way. 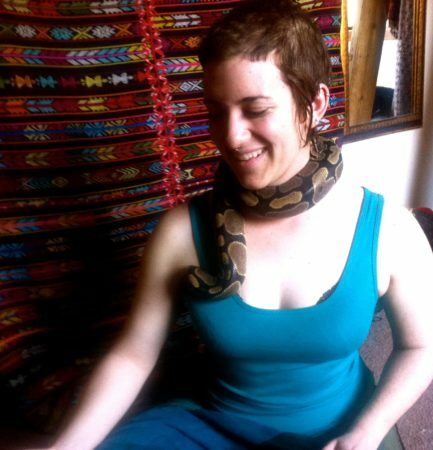 Movement meditation with snakes is a true partner dance: requiring presence, vulnerability, and deep listening. Snakes are masters of boundaries and subtle energetics. 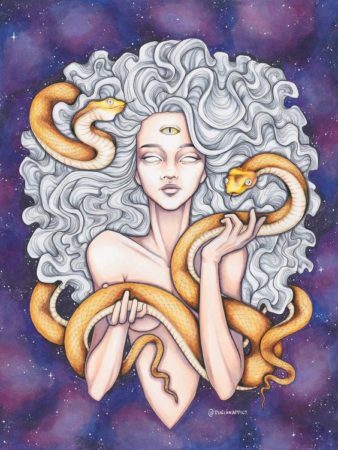 Some of the most rewarding aspects of the dance for me are psychic communication with my serpent partner that allow for beautiful synchronized movement, exploring new ways of responding to rhythm while being mindful of the snake’s needs (ie. secure anchor points on my body), and the channel states that can be entered through this work. To dance with snakes is to know a sacred mirror. It is a gift that I am deeply grateful for, and one that has brought profound healing into my life. I now have a visceral, cellular knowledge of myself as being worthy of divine love and my birthright soul power. Coming to know the Sanctum has been a prayer answered; it has given context and support for my soul longing for communion with serpents, sisters, and movement. The fears I have sacrificed in order to know this level of love have all been worth it. I give thanks to my past selves for being brave enough to shed their old skin. As I move forward on the serpent path, I embrace the unknown–the door that is unlocked with the key of being awake to this eternal now.